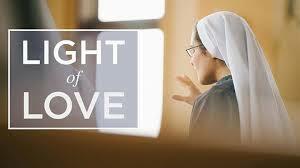 Light of Love is a new 60-minute documentary by Imagine Sisters. What, you ask, is “Imagine Sisters”? And whatever “Imagine Sisters” is, isn’t it bad syntax? “Imagine Sisters” is a movement (begun by Chicago seminarians—out of the goodness of their hearts and under the patronage of St. Therese) to encourage women’s religious vocations. “Imagine Sisters” greatest success has been on an eponymous Facebook page which currently sports over 16,000 “likes,” and has more than 2,000 “talking about this” at any given time. The Facebook page features many different congregations’ photos, links, retreat events, and the ever-popular nun memes. It’s serious and funny, poignant and light-hearted. The aim? To SHOW the joy and simplicity of the calling to be a bride of Christ; to be a meeting place for young women in discernment; and to make the charisms and ministries of various congregations known. The priesthood has had the glorious Fishers of Men film/DVD to portray and encourage priestly vocations (commissioned by the U.S. Bishops) for several years now, but there was no film on the Sisterhood. Until now. “Light of Love” is meant to fill that need. Individuals, young women, non-Catholics, Catholic schools, religious education programs, RCIA, and any other gatherings of the curious will now be able to hear it from “the horse’s mouth”: these women of God explaining their way of life. The five communities chosen are all active congregations (no cloistered), but with varying degrees of contemplation mixed in: Carmelite, Salesian, a newer congregation founded in Argentina, and two Franciscan congregations are represented. Healthcare, education, and working with the poor are the ministries of these particular Sisters.